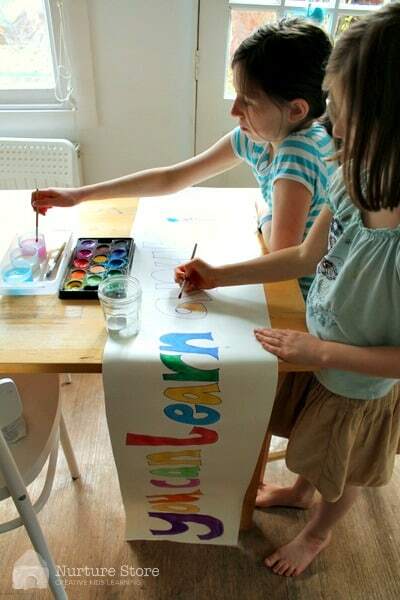 Start your learning year with a back to school craft that inspires :: we’re painting our Words of the Year! Hello September. After a wonderful summer of beaches and rivers and festivals, we are all happy to see the first few signs of autumn appearing. 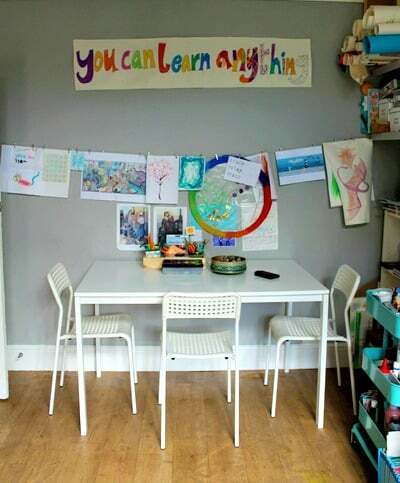 We have new stationery, a big stack of coloured paper, and plans for learning about the world and Greek gods. Have you seen this interview of Carol Dweck speaking with Sal Khan of the Khan Academy? I watched with my children and we had an interesting discussion about the power of having a ‘Growth Mindset’ – believing you can develop your abilities and grow you brain. I want to encourage them this year to embrace the idea that you can learn anything: discover your passion, find resources, and explore, try and persevere to learn awesome things. The Words of the Year that we made as an alternative to new years’ resolutions back in January have been helping us all year. So we decided to create a vibrant, visual reminder of a back-to-school version of our intentions. 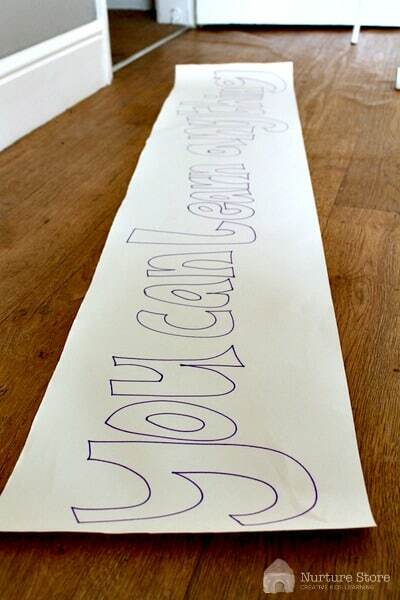 There are lots of inspirational quotes you could chose for your back-to-school banner. You could use just one word, fill a page with suggestions from each child, or take a famous quote. My children loved the phrase the Khan Academy uses: You can learn anything! We decided to go big with our back-to-school banner, and used a roll of wallpaper for our display. I drew out our chosen words in marker pen, and then handed it over to the girls to add colour. 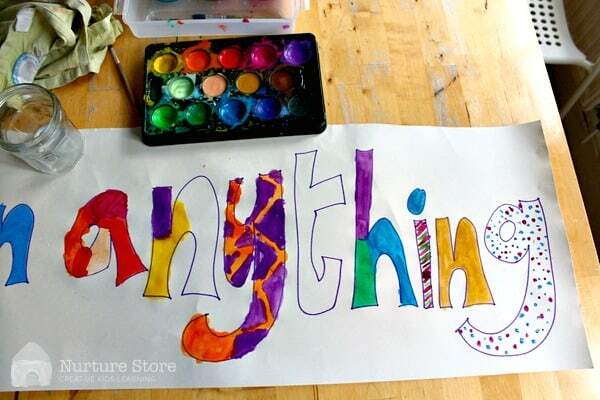 They used watercolour paints to fill in each letter, with a grand finale at the end. Once dry, we put our back-to-school banner up above our work table, a colourful, visual reminder of our plans for the year. 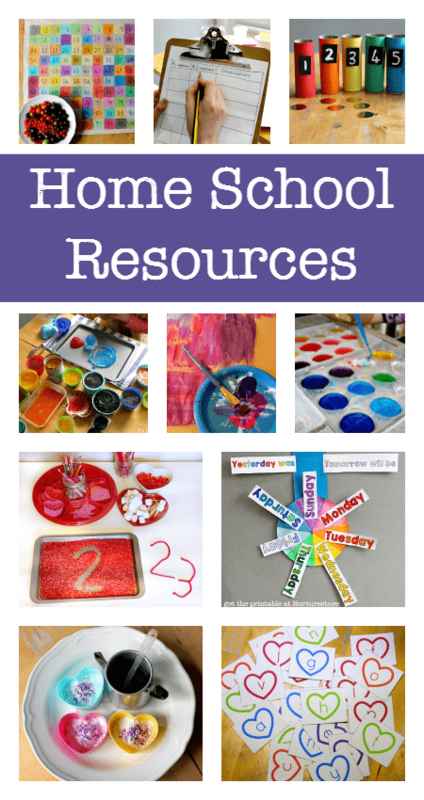 Did you see all my homeschool resources? They’ll help you have a great year. Click here to see them all.